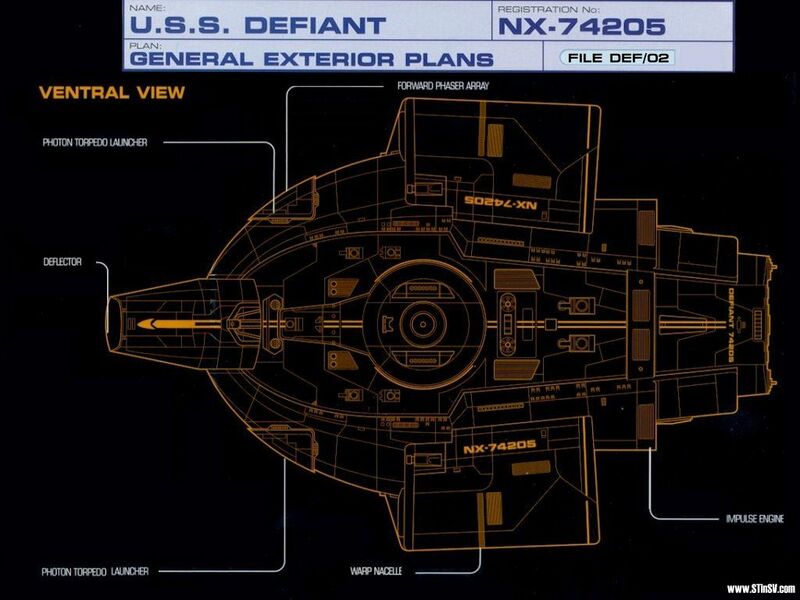 A Defiant-class starship is a heavily armored, limited-role Starfleet vessel developed at the Antares Fleet Yards in response to the Borg threat to the worlds of the Alpha and Beta Quadrants. 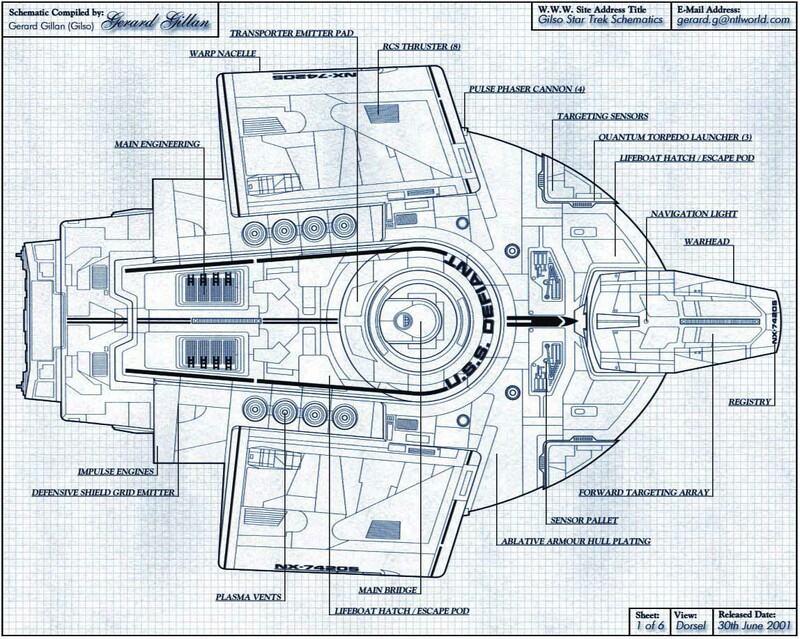 The project officially began in 2366 by Starfleet’s Advanced Starship Design Bureau. A number of hardware innovations and design adaptations allowed for an acceptable level of reliability versus speed of systems integration and vehicle construction. 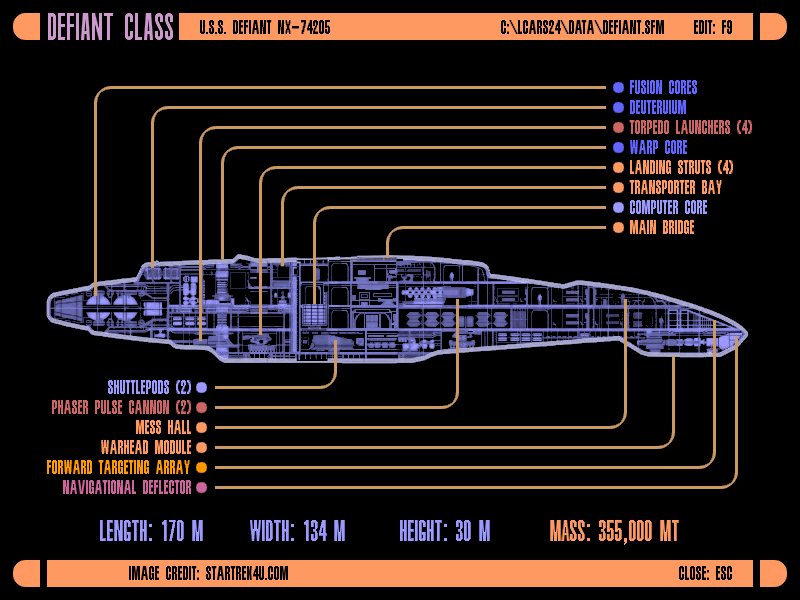 Defiant-class vessels are constructed of standard tritanium and duranium alloys and composites. The bridge has been submerged within a larger Deck 1. The entire vessel has been shortened to four decks plus allowances for crawlways and cable trunks. 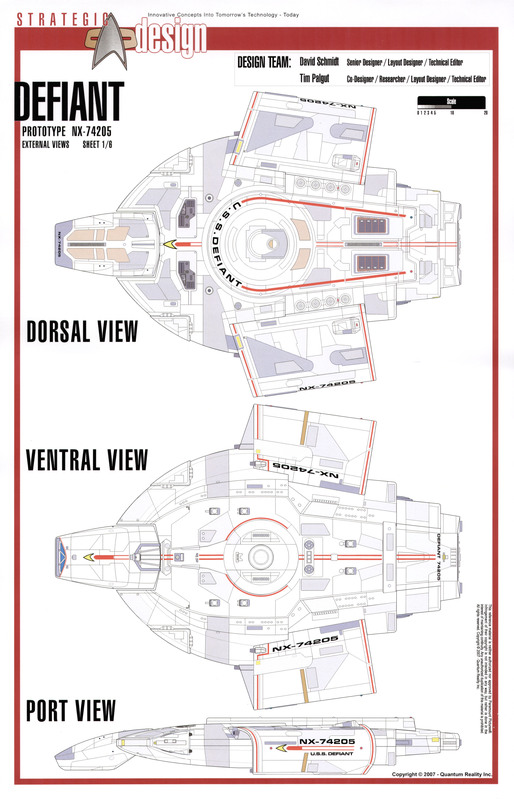 The notched forward hull has been equipped with a detachable pod consisting of the vehicle’s main sensor and navigational deflector, airlock module, and a last-resort matter-antimatter warhead. 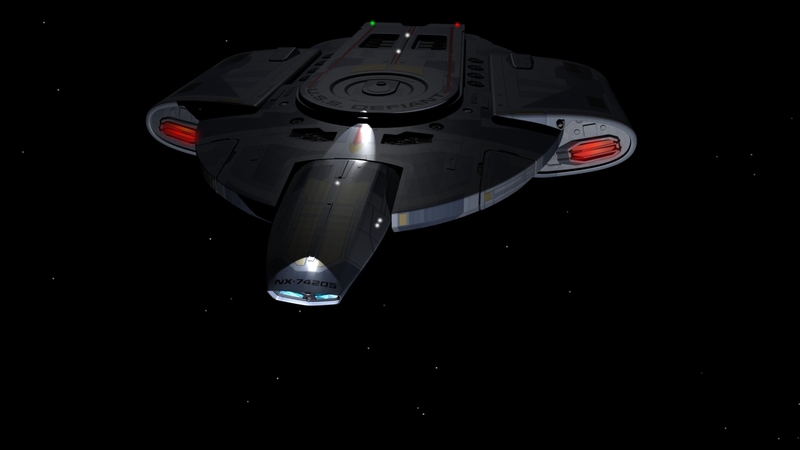 The warp nacelles have been brought inboard to a minimum safe distance for field EM, and all EPS weapon-power conduits have been truncated to provide a nearly zero lag time between activation signal and beam launch. 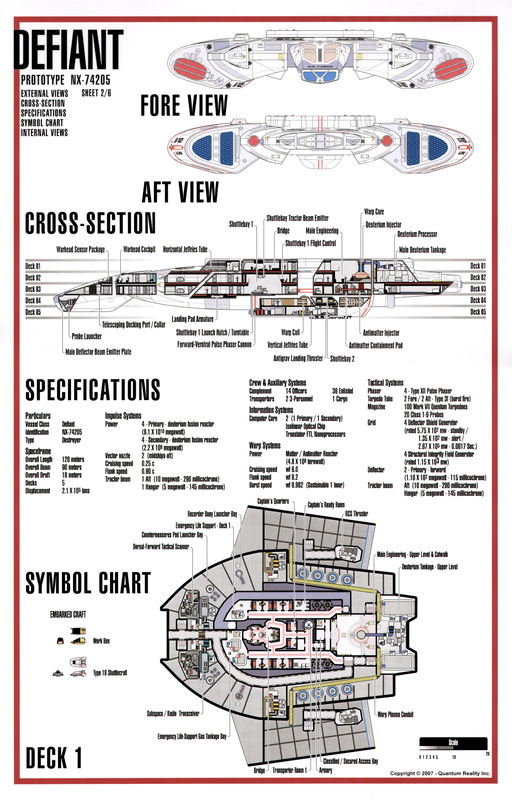 All protected internal systems that require access to the vessel exterior are equipped with articulated or jettisonable hull plates, so that most of the familiar structures are hidden from view, including shuttle bay doors, docking ports, lifeboats, impulse vents, and consumables resupply connectors. An integral set of ventral docking clamps and landing pads had been designed into Defiant for possible ditching operations as well as for recoverable planetary landings. 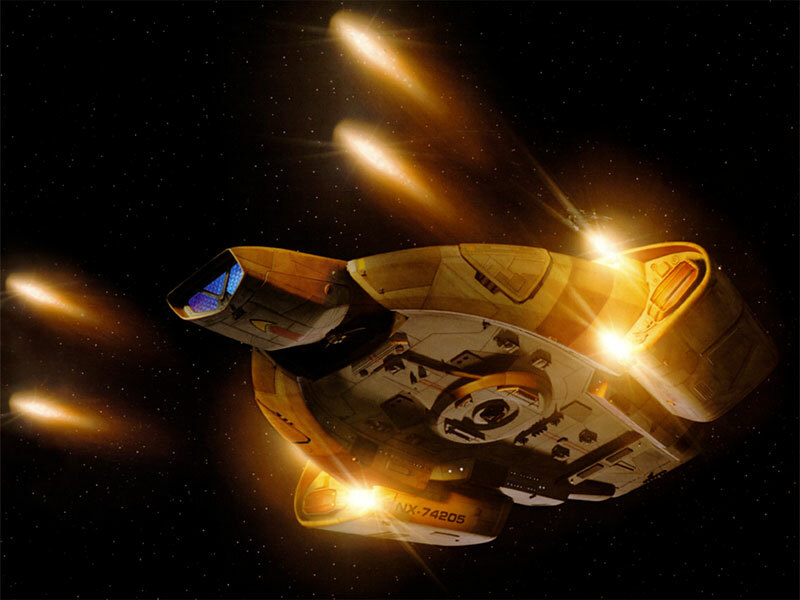 The USS Defiant NX-74205 was one of at least three Federation starships to bear the name, and the prototype of the Defiant-class vessel. 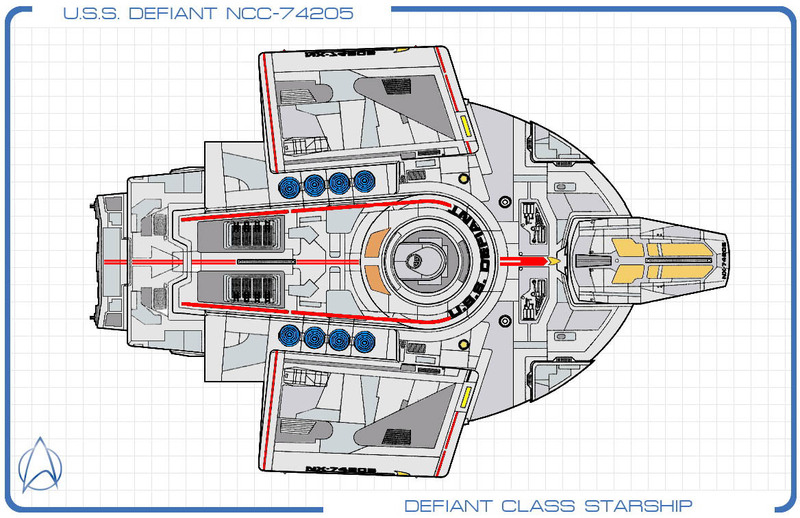 The Defiant-class was specifically designed to counter the Borg. Soon after the first vessel was completed however, a combination of a less urgent Borg threat and several design flaws caused Starfleet to suspend the project. 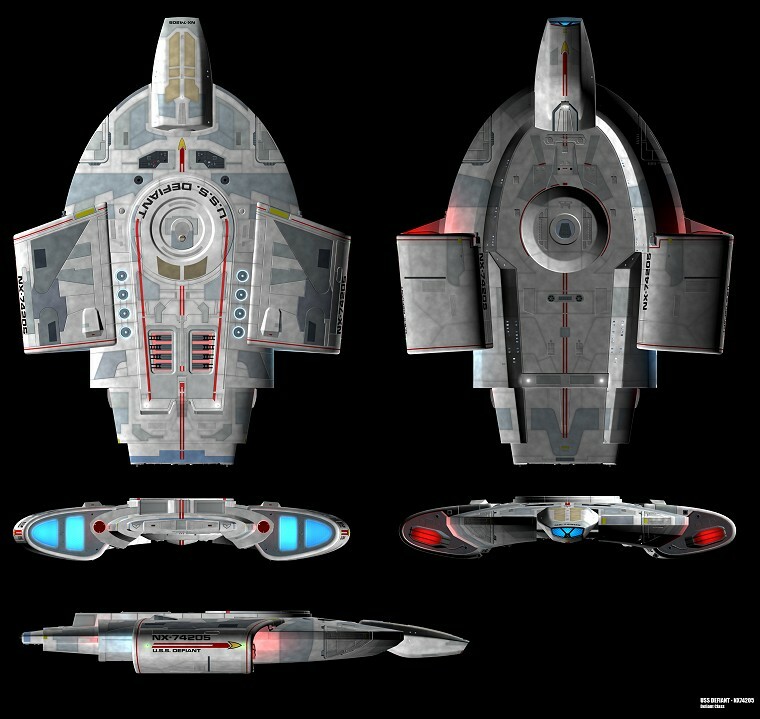 Early in 2371, the Defiant was taken out of storage and assigned to Deep Space 9 to protect the station from the Dominion. It was Starfleet’s first true warship and had no provision for families or diplomatic missions, no science labs, no holodecks, or any of the other comforts of home. 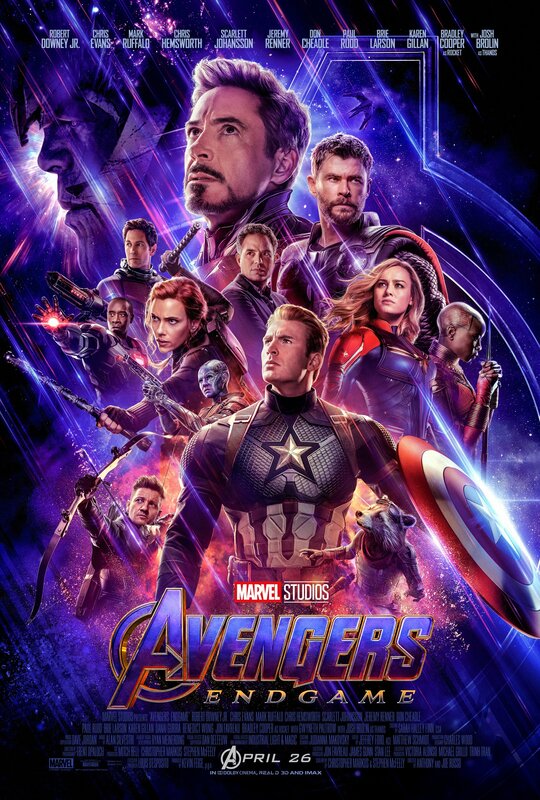 It was a heavily armored, stripped-down vessel that was created as a first strike vehicle for use in war, and incorporated the latest in Starfleet weaponry and defensive technology. 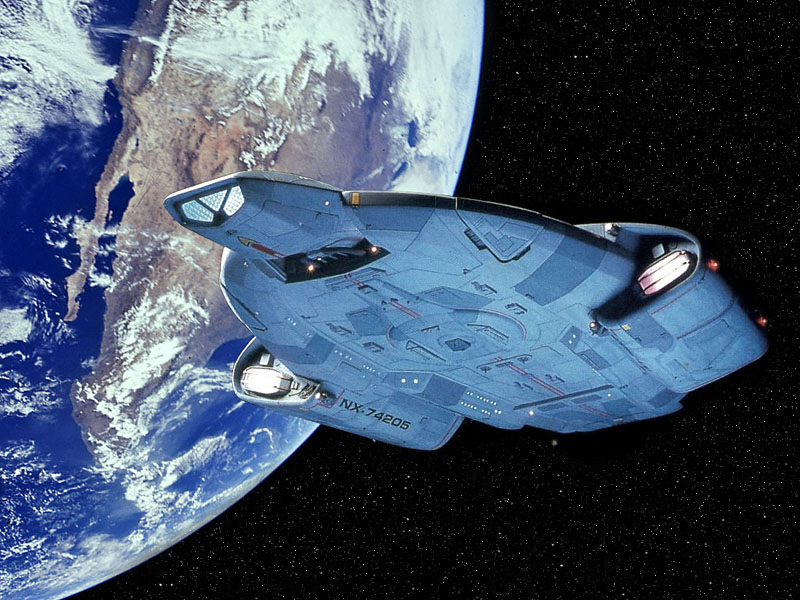 The ship was granted special dispensation to carry a Romulan cloaking device. The Romulans loaned and allowed the limited supervised use of the cloaking device in the Gamma Quadrant only. In return, the Federation would provide the Romulans any and all intelligence data collected in the Gamma Quadrant about the Dominion. 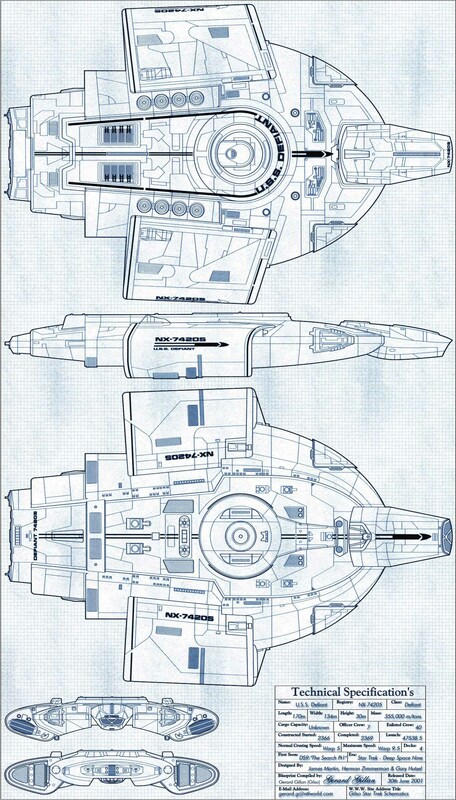 Starfleet eventually put the Defiant-class into production. 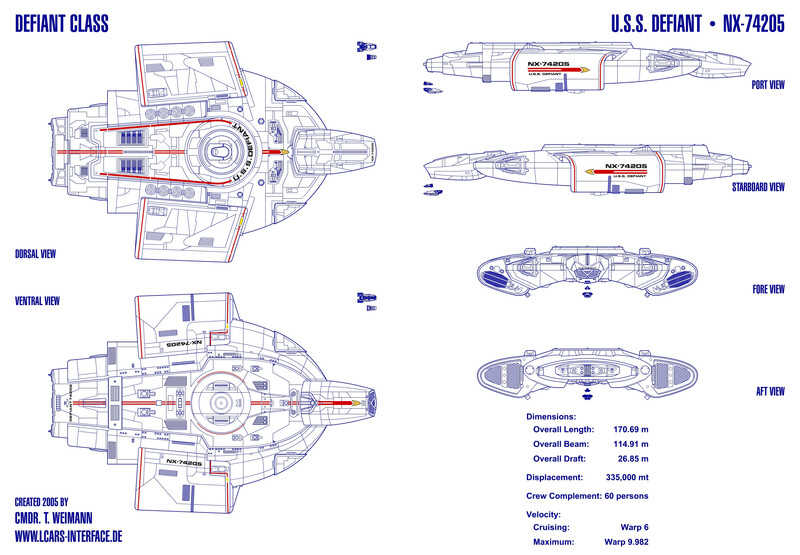 By the end of 2373, there were a significant number of Defiant-class ships in operation.